ABSTRACT: The Jebilet Massif, located in the southern part of the Moroccan Western Meseta, includes a sequence known as the Sarhlef Series, which comprises mostly black shales with subordinate volcanic rocks and hosts several massive sulfide deposits. Hitherto, the Sarhlef Series has received only scant biostratigraphic attention. Accordingly, a detailed palynological analysis of the shaly Sarhlef strata that embrace the massive sulfide deposit of Draa Sfar, ca. 20km north of Marrakech, is presented herein. The palynoflora consists predominantly of moderately well preserved miospores, together with quantitatively subordinate marine palynomorphs (acritarchs, prasinophyte phycomata) and scolecodonts. The miospore content, documented systematically herein, comprises 19 genera including 29 species, five of which (Cristatisporites mixtus, Densosporites dissonus, Indotriradites immutabilis, Vallatisporites extensivus and Endoculeospora marrakechensis) are newly established. 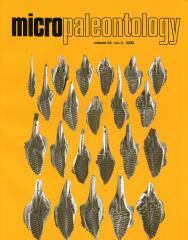 The Sarhlef miospore assemblage closely resembles those reported from late VisÃ©an-early Serpukhovian strata elsewhere in North Africa and adjacent regions. Some similarities are also evident with Western Gondwanan assemblages (viz., from the ParnaÃ­ba, SolimÃµes and Amazonas basins of northern Brazil). The palynological data, in conjunction with published faunal evidence accrued from the overlying lithostratigraphic unit, demonstrate that the age of the black shales of the Sarhlef Series hosting the Draa Sfar sulfide deposit can be constrained to the late VisÃ©an (Asbian); this, moreover, is corroborated by radiometric determinations from associated volcanic rocks.